Events in Dorset in August. Summer holiday time!!! Dorset is ideal for summer holidays, something for everyone. Then there are the events that are going on. Have a look, it is possible that there are some around the time you will be in Dorset. August is the month for Shows, Carnivals and Festivals!!! Dorset Food and Arts Festival 3rd August 2019. Queen Mother Square, Poundbury. Free event. Dorset Chilli Festival 3rd and 4th August 2019.. St Giles House, Wimborne St Giles. If you like chilli then this is for you. A Chilli fiesta!!! Lyme Regis Carnival & Regatta will be held on 3rd August to 11th August 2019. Plenty of great events in a delightful town. Lyme Regis is the Pearl of Dorset. Gillingham & Shaftesbury Show is on 14th August 2019 Great day out. Melplash Agricultural Show. 22nd August 2019, Showground, West Bay, Bridport. The friendly show. Tarrant Hinton hosts the The Great Dorset Steam Fair. and the National Heritage Show will be held 22nd to 26th August 2019. All in all it is considered the leading show of its kind in the world! Includes Music Festival Action packed entertainment. Oak Fair Stock Gaylard House, Sturminster Newton. 24th and 25th August 2019. For all those interested in timber and woodcraft. 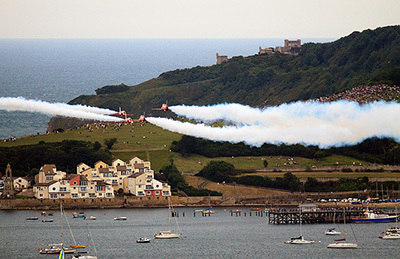 Bournemouth Air Festival 29th August to 1st September 2019. This is their 12th year. Bournemouth is a beautiful seaside location and the display is FREE. 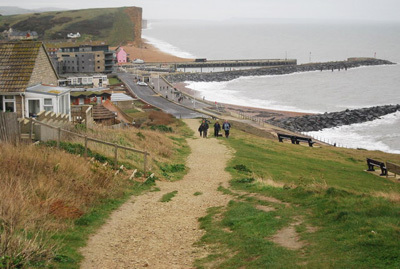 Looking down on West Bay from the South West Coastal Path. Looking for a seaside place for the family, it would be a job to go past Bournemouth or Weymouth, two old favourites. You could try Lyme Regis, delightful, if a little hilly. The Jurassic coast and the Southwest Coastal Path could be an idea. There are plenty of other footpaths and cycle ways all over the county. 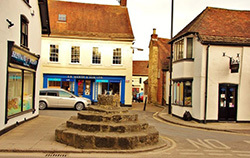 Wimborne St Giles is a tiny, pretty village on Cranborne Chase. Do you like coleslaw? Well the first cabbage cultivated in England is said to have been grown in the village in the early 1600's! The village is part of the Shaftesury Estate who own St Giles House. Lyme Regis, the Pearl of Dorset as it is known and indeed it is a pearl, a little gem on the southwest edge of the county. It is a delightful small seaside town with an ambience all of its own. It is part of the Jurassic Coast. Access can be found to the South West Coastal Path. Have a picnic with stunning views! Gillingham in the very north of the county. For Americans amongst us, Edward Rawson, who was secretary of the Massachusetts Bay Company was born in the town in 1615. Gillingham is a fast growing town with plenty of shops and easy access by car. Shaftesbury is a town in the north of the county on the Wiltshire border. Breathtaking views! Take the camera or even better the camcorder! King Canute's heart is buried in Shaftesbury Abbey. Visit the Hine Collection of Mechanical Music with its organ display in Mortier House in New Road. Bridport is an attractive little town in the south of the county and includes West Quay, Bridport's small harbour where fishing trips can be arranged. Here there are also a couple of beaches. On the X53 bus route from Poole to Exeter, a brilliant day out for one can stop off at an attractive place and catch the next bus on or back. Check the timetables. Sturminster Newton in the Blackmore Vale on the River Stour. Visit the Mill. Bulbarrow Hill is nearly 1000ft high and has wonderful views over the county, actually five counties can be seen. Or if you would like to browse around further try the navigation buttons on the left.